One of our favourite reviewers and most entertaining writers, Adam Rayner, recently reviewed our smallest (yet great) achievement: the Cinema 100 CT and we just happened to stumble upon the published review today. "After only a few moments I found myself looking at them slightly dumbfounded"
"In conjunction with an Anthem MRX300 receiver doing its RoomEQ thing, the CT100 array served up a delicious performance." "the initial impression was how classy and upmarket the whole Paradigm CT sound was. You get a slice of high-end from these bizarre little boxes. After only a few moments I found myself looking at them slightly dumbfounded." "...there is total synergy between all five cabinets...The Cinema subwoofer... is wonderful for the money... It supports the CT100s very well, right up to the bottom of the satellites’ ability. The blend between them is true and you’ll struggle to identify where the bass is coming from." "The Paradigms crafted a fabulous detail-rich sound, with crispy edges that cut easily through the crashes and explosions. This allows you to hear things going on in the background while the foreground is roaring. Tinkles, scratches and metal-on-metal sounds all had total intelligibility and definition." "The Paradigms crafted a fabulous detail-rich sound, with crispy edges." "I expected to hear the 100CT straining and popping, yet never really did. In fact it’s been a long time since such a small system has so amazed me, but these drivers, and that S-PAL 3.5in mid-range in particular, are a clever achievement." "Voices were clean and uncoloured, even when Hollywood’s finest are shouting, and the sheer size of the sound belies the size of the boxes." "This really is a system for someone who craves a big sound but wants to avoid room-dominating speakers." 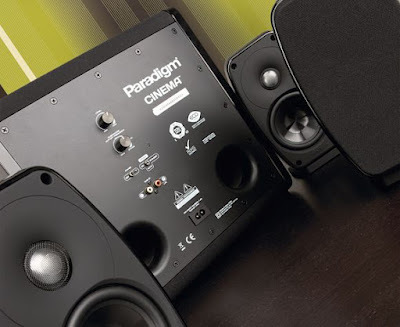 "So, from a subwoofer with six 10in drivers to a teeny atom bomb of a 3in speaker, Paradigm is now covering all the bases... Paradigm’s 100CT speakers, and the subwoofer that goes with them, form a bit of a wonder package"
We're happy to read that you like Paradigm gear, whether it be our entry level 5.1 speaker system or our biggest baddest (and most expensive) subwoofer! Click here! to read Adam's full review of the Cinema 100 CT.
Click here! for more info on Paradigm's Cinema speakers.